So many campaigns start in a tavern. It’s an easy way to put a bunch of characters in the same place at the same time. And even if you don’t start your campaign there, your players are bound to end up there at some point right? What about post-apocalyptic campaigns though? After watching a few different shows, we ended up playing a Deadworld campaign. It was full of zombies, ghouls, savage scavengers claiming to be saving the world, and ruins of settlements. You know where we never went though? A hospital. The game started some years after the world ended as we know it, and we never had a reason to visit a hospital, or what remained of one. 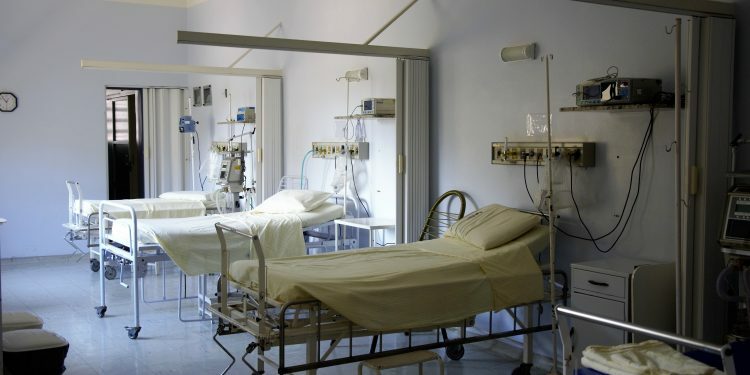 As our time progressed in Victoria I realized ward doors were sealed in the evenings, I discovered new rooms, and I learned some areas of the hospital can’t be accessed from other areas – even more fuel for the apocalypse fire. 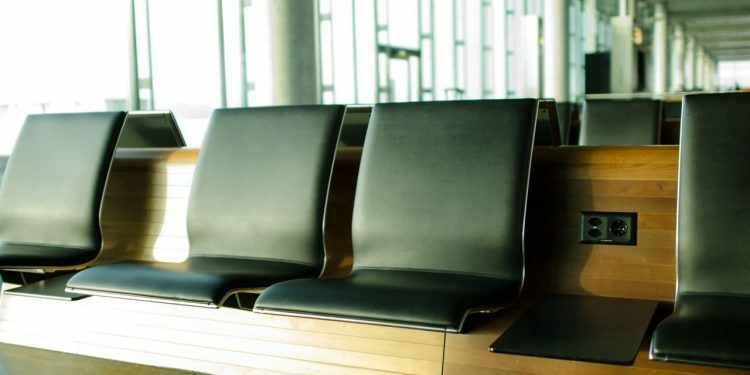 My mind would wander in the hopes of not spending 24/7 worrying about my really sick daughter I could do nothing to help (though worrying about zombies lurking nearby might not have been the best use of time, or the most reassuring thing to think about). We had a huge stash of unopened 2-cracker packages in our room, plus our own bags of granola bars, crackers and other non-perishables hidden out of view of our diet-restricted-rugrat. What was hiding in other people’s rooms? How about that snack cupboard down the hall with its own collection of single packaged crackers and digestive cookies? And that’s before you even hit the cafeteria or smash the vending machines (should you dare to make that much noise). And medical supplies… you’ve got bandages and gauze, sterile wipes, braces, crutches, gloves, the list goes on. And wheelchairs could serve as a great way to move bundles of goods (or you know, a person unable to move easily). Plus on a pediatrics floor don’t forget the stashes of formula, wipes and diapers. No kids in your game? Diapers are still super handy for absorbing a lot of blood on an open wound, or filling with warm water and applying to the body to make accessing a vein easier. And I’m not recommending anyone try formula, but come on, if the world ended, I think we’d all take the calories we can get… and I might be more likely to try formula than roasted rat captured in the basement…. but that’s just me. Plus, you’ve got beds, blankets and flat rubber pillows galore! These beds could be slept on for sure, but don’t forget you can use them to barricade areas, and blankets don’t just keep you warm, they can be used to block the light from the windows, ripped apart as more bandages, used to to wrap and carry items, or even altered and pinned as make-shift clothing if those open backed hospital gowns aren’t your thing and your other clothing is trashed. Except, we have no time to game as we continue to be separated by a (small) body of water. Which means we need you to let us know: have you played any post-apocalyptic games? Were any scenes set in the hospital? And if so, did they feature Rugrat #3 and I lurking in abandoned halls, desperate to make our exit to the outside world? 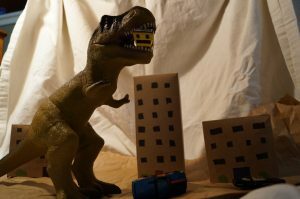 For those who haven’t heard about Dinovember: welcome! 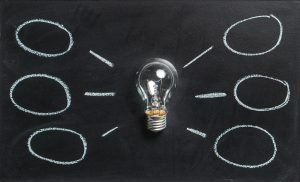 We wrote a blog post last year that can bring you up to speed, and I encourage you to check it out. 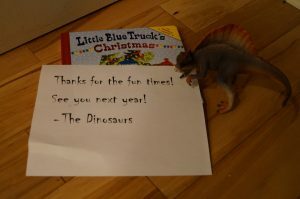 For those who followed our dinoescapades last year, welcome back! We’ve been doing this for a few years now and the dinosaurs have done everything from smearing cupcakes on the cupboards to colouring on the fridge to playing with the shaving cream in the bathroom. The kids have found them building outside, hijacking a ride to school, and having music concerts. Book forts, colouring pages, cereal across the floor – they’ve all been done at least once, maybe twice. Almost as scary as the house on down the road with the carnival decorations and the clown hiding behind the red balloons with a bowl of candy, the word made my chest tighten. My mind searched frantically for answers. 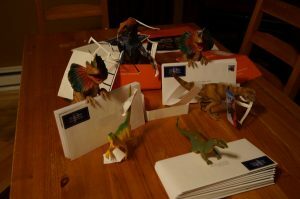 I wondered if it was too late to take a month long vacation (or send the dinosaurs on one). 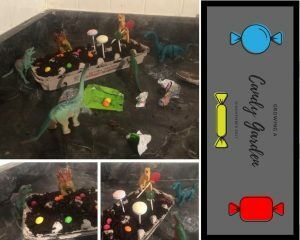 After hearing at length from the rugrats that they hoped the dinosaurs wouldn’t eat their candy *again,* I had to come up with something new. 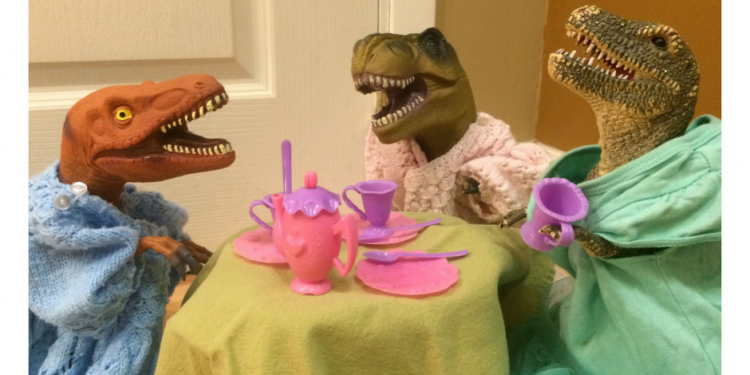 Don’t get me wrong, I love how exciting and magical Dinovember is. And I started the whole thing in our house. So just as the pressure of Halloween costumes begin to wane, the anxiety of dinocreativity begins to rear its ugly giant reptilian head in our house. One of my favourites so far this year, I fear this make-shift snowman may have been part of an elaborate snow dance done by the dinosaurs as it snowed 24 hours later. 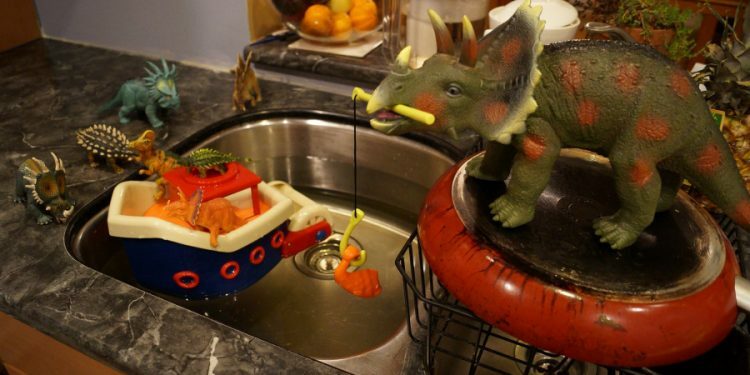 There have already been the moments of panic where I wonder what to do tonight, and sometimes I wish I could take the same tactic as some do with elf on a shelf (no way is that creepy creature coming into our house on the heels of Dinovember). But I digress. 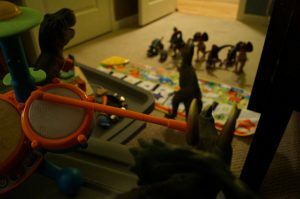 Dinovember is happening. Rugrat #1 wasn’t the biggest fan of this, but Rugrat #2 enjoyed it, and Rugrat #3 loved it so much she insisted on napping with these lovely ladies, their tea set, and the table (while chanting “Tea Par-tay!” right up until she fell asleep). 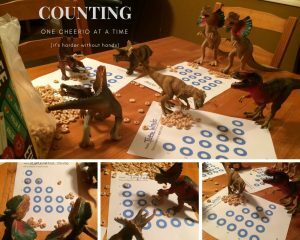 The rugrats enjoyed the early morning snack created by this dinosaur game. The game, not so much, but it is a bit too easy for most of them (though these poor dinosaurs struggled). The rugrats, in unison, declared this “awesome.” I liked that it was super easy (and in fact done after everyone woke up, in a tiny seldom seen corner of our second kitchen). 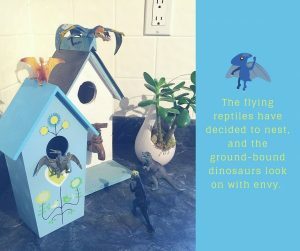 Desperate for their own place to call home, the ground-bound dinos set off on their own adventure, far from the picture perfect bird town houses. This was the biggest hit with Rugrat #3 who has exiled the dinosaurs and minis alike in favour of her ponies. After last night’s hard session of castle building and takeover, the dinosaurs elected to try something a little more relaxing. 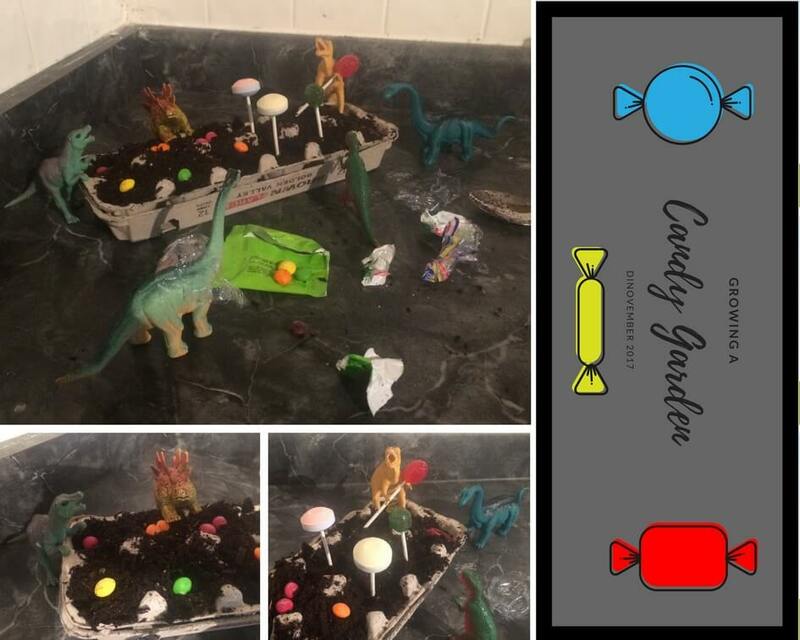 Sick of their meat and plant-based diets, the dinosaurs decided to plant a candy garden. 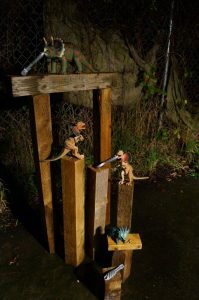 The rugrats were sad to see the dinosaurs had stolen their candy for this fruitless project. 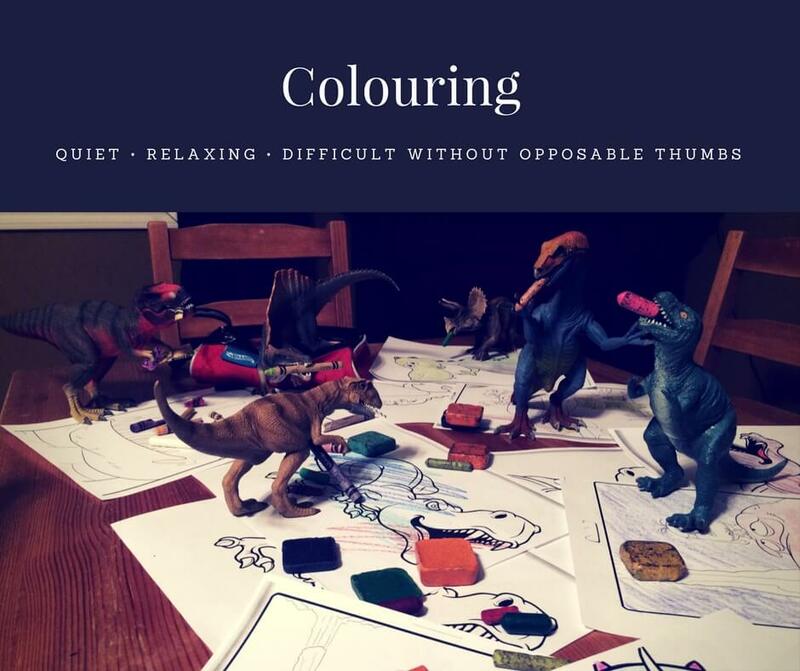 The dinos went wild with the erasable marker, colouring all over photos and the windows. The rugrats were not pleased. 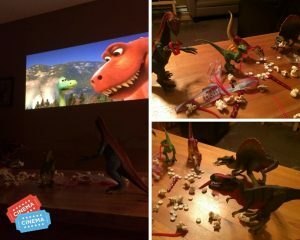 While the two of the rugrats enjoyed a sleepover at Nana’s, the dinosaurs went went with a movie marathon – complete with snacks galore! The kids thought the dinosaurs did nothing… then we found this. “Yep, that’s what they did.” – Rugrat#2 Well, that’s a late night mess… and a lot of caffeine. 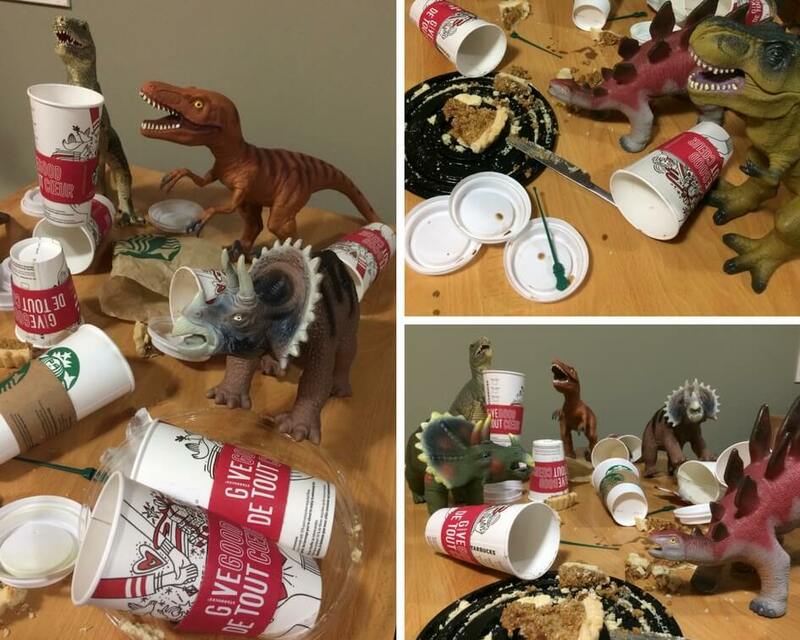 So tell us, have you participated in Dinovember? 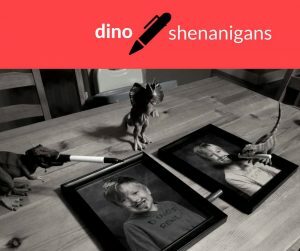 What’s your favourite one of our dinoshenanigans? Tell us! We’d love to know. Some of our favorites haven’t been such a hit with the kids. (But man did I enjoy colouring all over the fridge and watching the kids clean that up so the dinosaurs didn’t get in trouble!) Some of our random/last minute adventures are beloved by all the rugrats. It can be hard to tell what’s going to be a success and what will be an eye roll. So chime in! Let us know what you love! 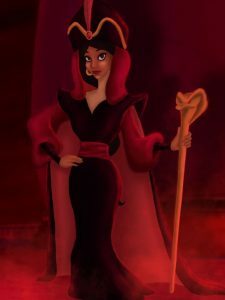 I was scrolling through my Facebook feed the other day and found this post on 15 Disney Villains Reimagined as Princesses. It isn’t the only time I have seen something like this; there have been similar ones on Disney princesses later in their lives, Disney characters reimagined as adorable pin up girls, the 42 gender-bending Disney characters, the super creepy images of your favorite childhood characters reimagined as criminals and villains (I take no responsibility for ruining how you view these characters should you click on that link), and the less creepy young cartoon characters reimagined as adults. While I think the art is absolutely stunning, I have a few issues with the first post (why does every single one have to be tiny and “perfect”? Surely Jaffar could have still been princess with a prominent nose), I do love this idea of reimagined characters, and these posts are evidence I’m not the only one. 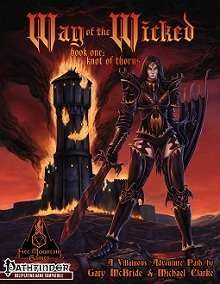 The same way companies like Paizo have their iconics, we seem to be hooked on recurring PCs. With six different campaigns played, four have used mostly the same PCs (well, the same PC – we play a lot of one to one gaming, so some of these recurring faces are “GM-NPCs”). This particular PC has been created with different classes (rogue/anti-paladin, mesmerist, rogue [knife master], and now with SFRPG an envoy). She has always been human, and always charismatic. There have been slight variants in her background, some differences in skill sets, and various alignments have been explored (from neutral evil to the most recent lawful good). She’s had different occupations (albeit most were various versions of an adventurers), different friends (though many of the same NPCs play a prominent role in these different “lives”), and different goals, but there is still something about her that feels the same. I sometimes think about how various versions of this character would fare if dropped into a different world/campaign. 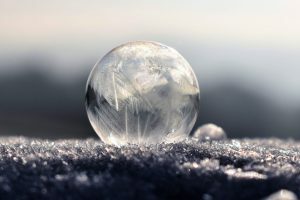 Each one has been built, more or less, for the campaign and the world it is set in – would that mesmerist have made a better ruler than the rogue/anti-paladin? Could the knife throwing rogue have succeeded in occult investigations? I’m fairly certain SFRPG’s envoy never would have managed to break out of prison and win the hearts of minds of the citizens the way the rogue/anti-paladin did. With these similar and yet different worlds, Ken and I find that many NPCs make a resurgence. While this started as a nod to previous campaigns, but it has become more than that. Winthrop, a simple hunter who petitioned my first (and favourite iteration) PC, who was queen of a country, for the right to lead hunting trips in a nearby wood, was one of her best friends and adventuring companions in our Supernatural inspired campaign, and played a prominent role in the post-apocalyptic one as well. Argus, a ship captain the same version of a PC had a tryst with was renamed Andy and was her best friend, and long time companion in yet another campaign. He’s made a reappearance in the Way of the Worlds campaign as her fiance, and has resumed his captain status with a star ship. Lys, the conniving young assistant at a church in Way of the Wicked (who did her best to undermine my PC) is the most devoted assistant in the current campaign, while Bill, a dedicated and determined cohort in Way of the Wicked repaid my PC for saving her from multiple zombies in our post-apocalyptic campaign by stealing everything from my PC while she slept. The recent space campaign has even seen the Varisian pirate captain from my first solo campaign reimagined; now a space pirate NPC, she has had a few interactions with my PC and is bound to have a few more. And of course there’s Davia. One of the four main PC/NPCs in one of our first campaigns, this savage blonde beauty remains so fierce and vibrant in every single one of her variants (no matter how small the cameo) she was reimagined as the top dog in our 5-star 5e NPCs: Bullies and Brutes PDF. I love seeing a different side of these NPCs, and since their nature, their sense of duty, and their interactions with my PC are different with each campaign, their familiar face doesn’t always put me at ease (especially after that fateful night trustworthy Bill took everything!). Have You Reimagined or Repurposed NPCs or PCs? I have to imagine this can be a fun thing for a GM as well – why create something brand new when you can repurpose something you have? It’s great when an NPC from one campaign can appear in another one, where continuity is possible, but what if there is no continuity? That favorite PC you created? Bring him back as an NPC in a different campaign. That NPC or PC who was wiped out quickly because of a few bad dice rolls? Maybe in a different campaign he or she developed a little differently and has had a bit more success. 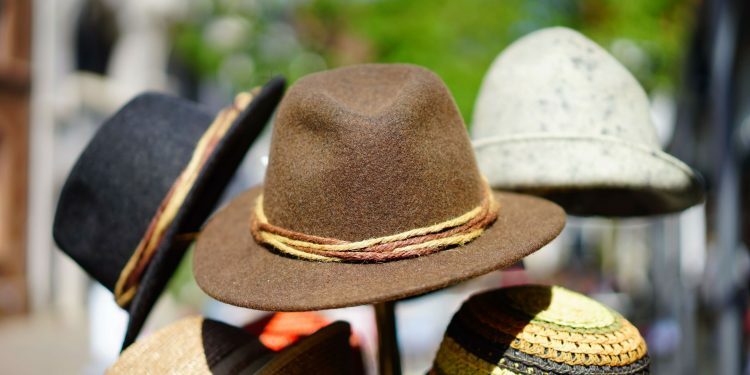 Let those characters try on a new hat, give them a chance to help you answer “what if” and see where is takes the game. Have you ever tried this? Have any of your characters made an appearance in different campaigns as reimagined versions of their former selves? Warning: this post is a bit off topic for an RPG publisher’s website, maybe. Humour me here. 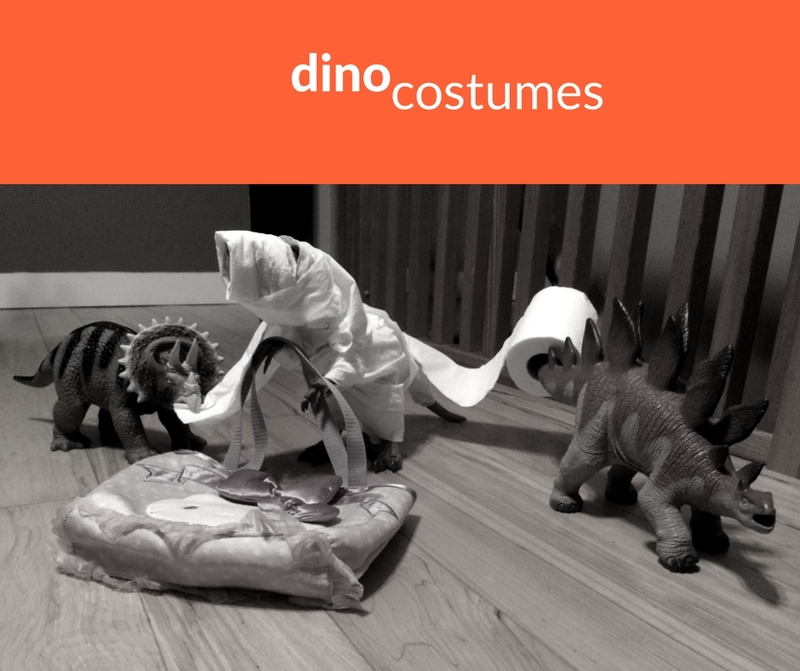 If you haven’t heard about Dinovember yet, you are missing out. 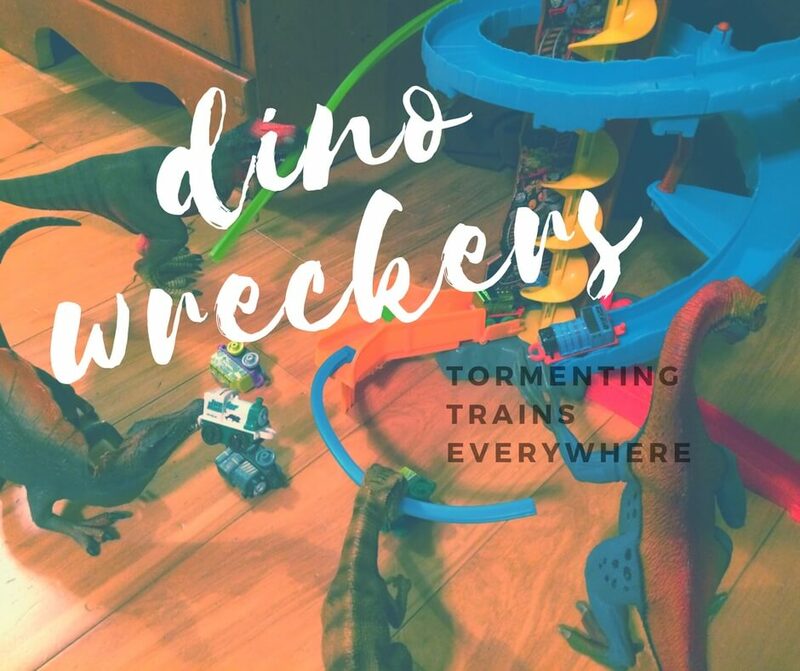 This is a highlight for the dire rugrats in our lives, though by the end of the month it is often a burden on us as we scramble for yet another thing for the dinosaurs to do and Ken curses me for introducing it in the first place. DAY 1: The dinosaurs got into the Halloween candy. 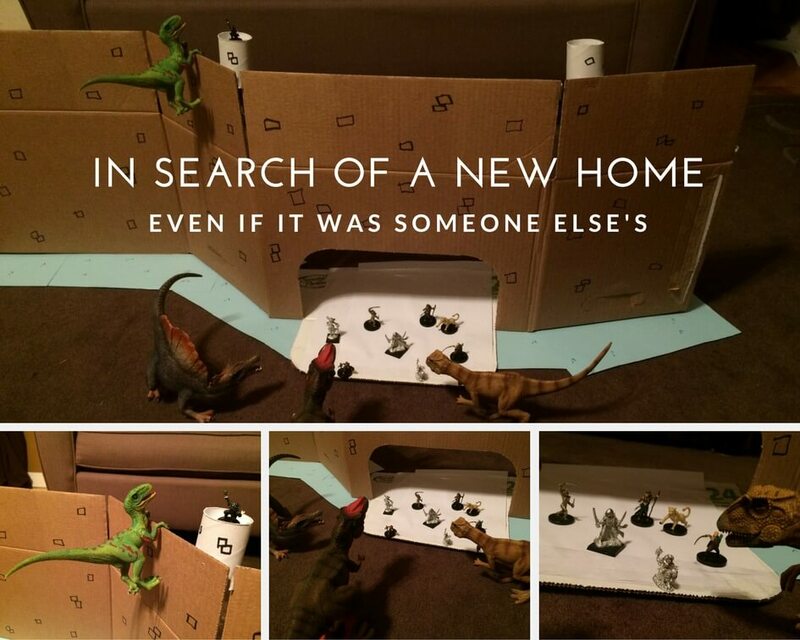 It seems to be the way they start every Dinovember, and who can blame them? 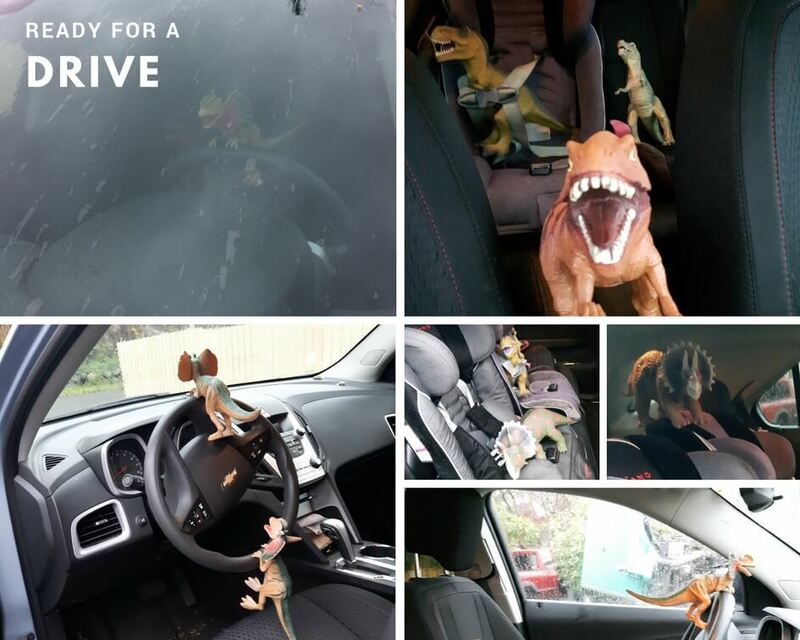 It took off like wildfire and since 2012 people have been sharing their own pictures of what their dinosaurs did last night. 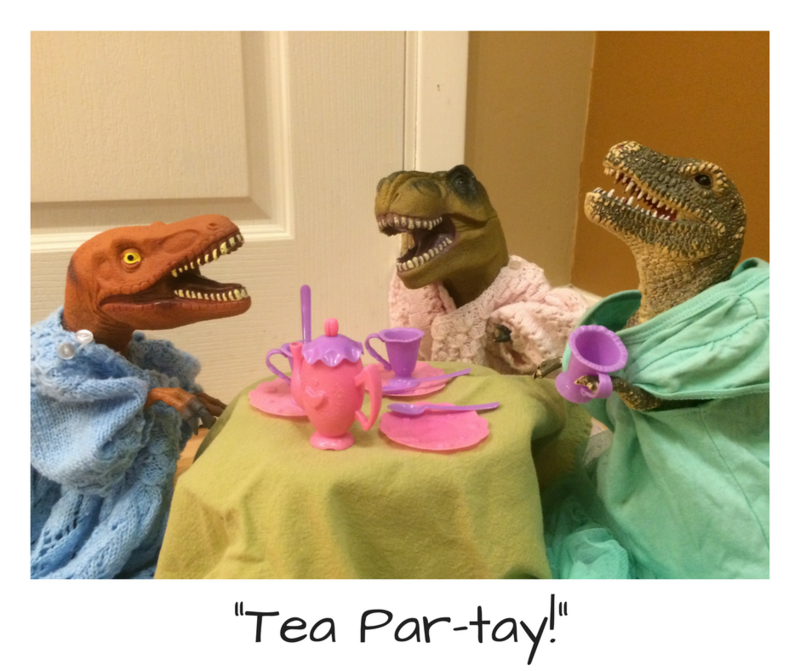 DAY 2: With a new double toaster in the house, the dinosaurs seemed keen on making a midnight snack. Two points for team work? 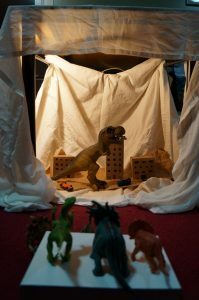 It is a great way to get kids away from the screens, and back to using their imagination. 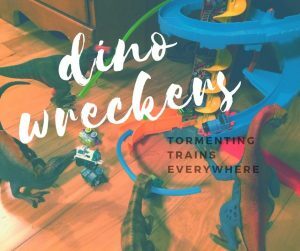 We’ve often found our kids setting the dinosaurs up again, when they think we aren’t looking, and then announcing the dinosaurs did something else and showing us incredible and creative things. 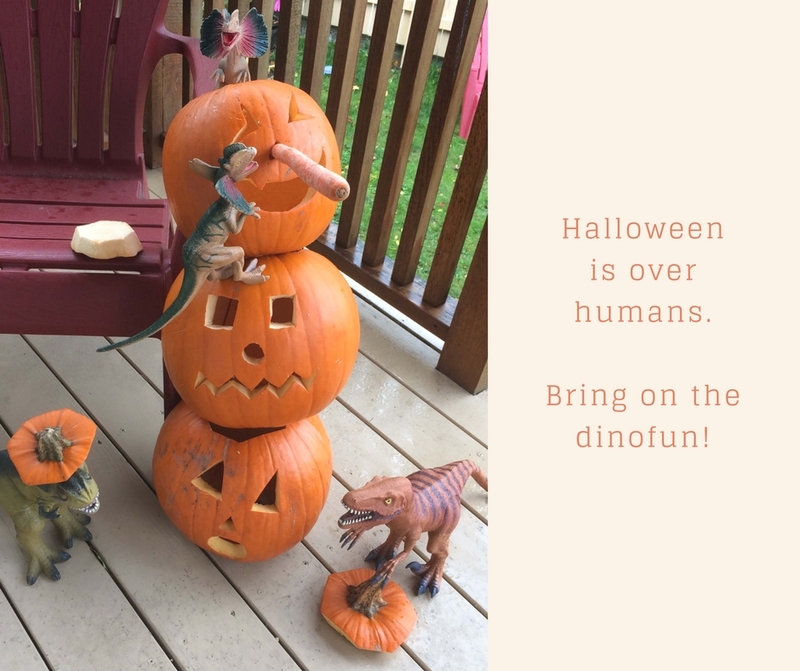 They are forever guessing what could be coming next, and they’ve learned to be really good sports when the dinosaurs have done terrible things (like eat some of their Halloween candy). 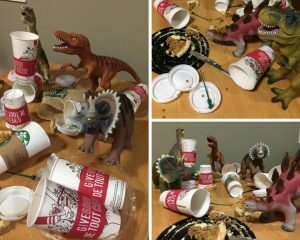 DAY 3: The dinosaurs said goodbye to Halloween by smashing the pumpkins. “I am not impressed, dinosaurs,” said Rugrat#2. It’s a game we all get to play for the whole month. It forces Ken and me to be creative, and it helps the kids use their imaginations and believe in something amazing. 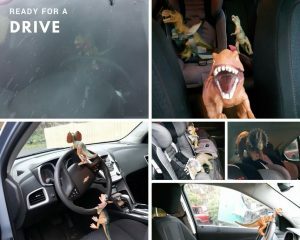 I hope you’ve enjoyed the photos from this month so far; no doubt those dinosaurs will be up to more shenanigans before the month is through. 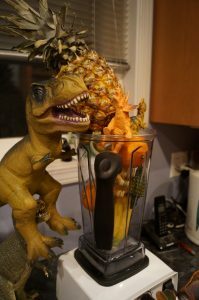 Have you ever done Dinovember? Share in the comments your favourite thing you’ve seen them do!